Like the elite car it’s named for, Ferrari II is a luxury vehicle to enjoy outstanding Outer Banks vacations. Located in the endlessly fun town of Nags Head, guests will be just moments away from exceptional shopping, restaurants, attractions, and golf at the renowned Nags Head Golf Links. With 8 bright master bedrooms with 8 full baths and 2 partial bathrooms, and beach access to the picturesque shoreline found just 175 yards away, this elite vacation rental will be a treasured retreat for families for years to come. Let the kids expend a little energy with a splash in the outdoor private pool, which is perfectly enclosed to ensure plenty of privacy. Adults can look on from the comfort of the adjacent lounge chairs, the picnic table that’s perfect for poolside snacking, or the nearby hot tub which provides a fine way to unwind after a long day on the sand. On a rare cloudy afternoon, retreat to the ground level where the recreation room/den provides hours of entertainment. Enjoy a little friendly competition, courtesy of the pool table and arcade games, or relax in front of the TV / DVD in the quieter den area. A wet bar, laundry room and half bath are found nearby for extra convenience, as well as two twin bedrooms – each featuring a pyramid bunk and a bunk set. The second level is home to a four master bedrooms, (including 2 queen bedrooms and 2 king bedrooms), that are all close to the central and quiet den with TV / DVD. Step outside the sliders to enjoy crisp ocean breezes from the shaded deck, or just relax in solitude, and enjoy your own private corner of this accommodating sandcastle. The expansive great room awaits on the top level, and serves as the perfect spot to recap the adventures of the day in absolute style and comfort. Step out to the ocean-facing deck to enjoy an Atlantic sunrise, or recline in the gracious living area which boasts a TV/DVD and plenty of bright sunshine trickling in from the windows. A gourmet kitchen is found nearby, complete with a central breakfast bar and additional seating, as well as the lush dining area which boasts plenty of elbow room for multiple guests. Nearby, tired vacationers can unwind in the pristine two king master bedrooms, one featuring Jack and Jill sinks and a decadent separate tub and shower. From the suite of private master bedrooms to the refreshing private pool, guests will be surrounded by a heart-racing world of fun at the prestigious Ferrari II. 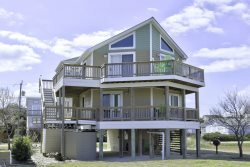 Close to all the top attractions, and yet feeling like an all-inclusive resort, this vacation rental will charm families who appreciate an all-encompassing and elite Outer Banks experience.